Over the years I've learned a few tricks that have helped make my Shih Tzu dogs bath time a lot less stressful for both them and me. By using these 8 simple tips for bathing your Shih Tzu, can make the whole experience better for both of you too! 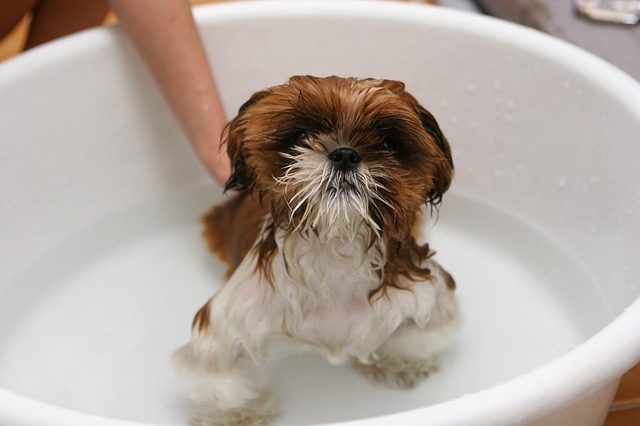 Let me explain why these tips will make bathing your Shih Tzu better for both you and your dog. Okay seems pretty basic. Many of you probably already do this, but it's a good first step. Many dogs enjoy a good combing of their coats. Brushing your dog’s coat not only might be a good experience for them, but it helps you bathe them too. Working out tangles and knots allows shampoo to get through the coat and to the skin more easily. Also, brushing helps remove any dirt build-up which also makes it easier to wash your dog. Your dog is out of his element standing in a slick bathtub. Use a rubber or textured grip, (like the Gorilla Grip Tub Mat from Amazon) to help your dog stand comfortably while getting a bath. Some people put a towel in the bottom of the tub if they do not have a rubber grip. This will do just fine if you are in a pinch! For small dogs and puppies, you may opt to bathe them in the sink instead of the tub, or use a portable tub. Grips for the bottom of your sink are less common than grips for your tub, so a towel is an option in this case too! This may come as a surprise to you, but dogs have sensitive skin. I would have thought with them being related to wolves and the wilderness, they would have tough skin. But, it turns out that human shampoo and soap can irritate a dog’s skin and cause itchiness and dryness. Using dog-friendly shampoos, like Earthbath Oatmeal & Aloe Shampoo helps promote a healthy coat and restore your dog’s naturally occurring oils. Plus, these shampoos feel more gentle on your dog’s eyes, though you should try to avoid getting it in their eyes in the first place. As mentioned in the section about dog-friendly shampoo, your dog’s skin is sensitive. Some of us like scalding hot showers, but this will not do for your dog. It is safer to use lukewarm water with your dog. This is more comfortable than cold water but is not harmful either. If your dog has a skin condition, there may be an exception to this rule. Talk to your dog’s veterinarian for recommended a water temperature if your dog has irritated or hypersensitive skin. Starting your dog’s bath by washing his head first can make for an unpleasant experience for him. If soap gets in his eyes and you still have the rest of the body to go, then he suffers while you finish the bath. This results in your dog being afraid of getting bathed when the time next comes around. Also, your dog’s body temperature will thank you if you start at the feet. Since your dog is not submerged but is standing in the water, he will feel better if he is not standing while dripping and getting cold. After you lather up his body from the feet up, you rinse in the opposite direction: from head to feet. This helps close the process quickly and minimizes the time that shampoo is near your dog’s eyes. If you have a Shih Tzu who is constantly trying to get out of the tub while you are bathing him (I'm talking about you Rufus!) you know how frustrating and dangerous it can be. I've found using a restraint like the Pro Guard Dog Grooming Stay-N-Wash Tub Restraint, will help you safely keep your pup in the tub. This way you can get him clean without worrying about chasing a wet dog down the hall or slipping in the bathroom. Drying your dog with a towel is not the simplest task, and you may get a little wet in the process, but this is the most effective method. Don’t give into the temptation to let your dog outside to air dry. Dogs are not familiar with a clean shampoo scent, so if you let a freshly bathed and wet dog outside to air dry, he’s going to roll in mud and dirt to absorb new smells. And ruin all your hard work. Some sources recommend using a hair dryer to dry your dog. This may be okay, but consider your dog’s personality before doing this. Some dogs are afraid of loud noises. Some dogs think the hair dryer is a threat and try to fight it, which makes it difficult to dry them. Although, it is cute for a minute. If you do use a dryer be sure to use a cooler setting and move it around frequently so there's less chance of burning them. I know, you may be thinking that you’re the one who needs a reward for bathing your dog. But, your dog will cooperate with the process better if it is a rewarding experience. Rewarding a dog for certain tasks reinforces good behavior. If you want your Shih Tzu to cooperate better with bath time, then try using special treats you only give him before or after the bath. Keep this reward specific to bath time and do not use it in other situations. This helps ensure your dog will associate the treat or toy with the only the bath, which helps them get in the tub without fighting you about it. Also, if your dog runs when you start the water or say “bath” then do not chase him. Chasing him encourages him to run more. It may start to become a game to him, which rewards the negative behavior of running instead of encouraging the good behavior of getting in the tub! People have conflicting opinions on the how often you should bathe your Shih Tzu. Some say bathing too often inhibits the production of your dog’s natural oils, and recommend every 3 weeks. Others say a weekly bath is fine. If you are unsure about how often to bathe your dog, you should talk to your dog’s veterinarian. Long haired "show dogs" like the Shih Tzu are typically bathed daily. But if you are not concerned with having your dog win first prize sitting around the house, you don't have to bathe him as often. However, a daily brushing to remove dirt and keep matting from forming would be beneficial to your Shih Tzu. You can better make an informed decision about how often to bathe your dog by considering the length of the coat, and the frequency of time he spends time outside. A short-haired, indoor dog may not need as frequent baths as a long-haired, outdoor dog! But, in any case, don’t hesitate if your dog smells funny or got himself into a mess. When this happens, giving your dog a bath can help him feel better. And, your nose will appreciate a clean pup too!